QUESTION ONE: HOW FAST IS THE KTM 125SX? For the last three years KTM has built tiddlers that were more than capable of running with Japanese 125s. For 2001, it has built a tiddler that’s more than capable of beating them. QUESTION TWO: WHAT DID THEY CHANGE? Everything. Except for the fork, shock and carb, everythingelse on the 2001 KTM 125SX is new, redesigned or refined. QUESTION THREE: WHAT’S DIFFERENT ABOUT THE ENGINE? 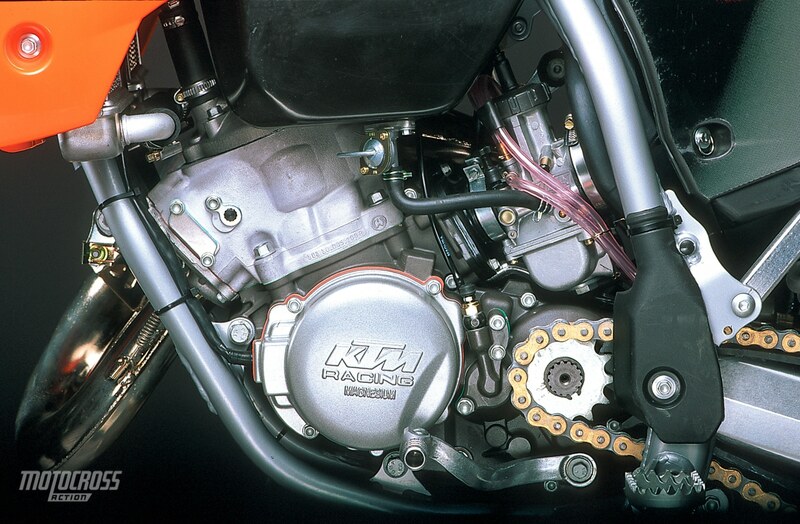 The bore and stroke are totally new for KTM, although they are old hat for the Japanese brands. 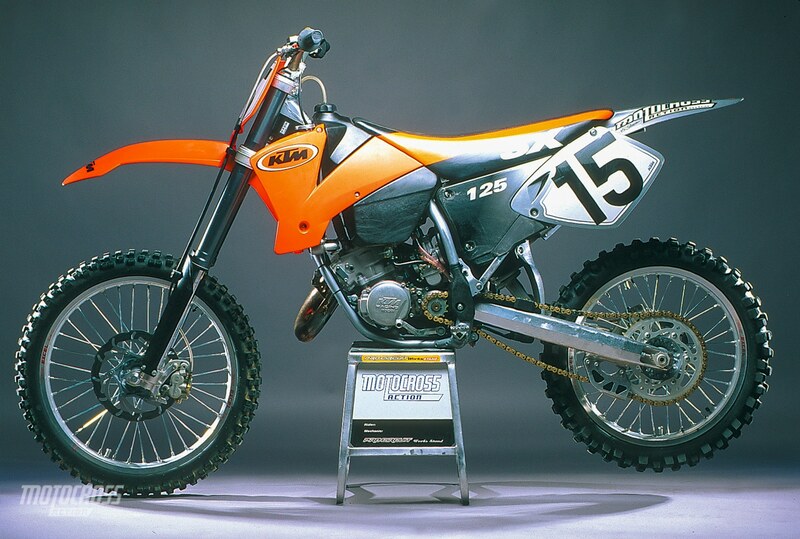 For years KTM was the black sheep of the 125 family with a 54.25 mm by 54 mm bore and stroke. For 2001, they have the same 54 mm bore and 54.5 mm stroke that we’ve all come to know and love on the Japanese 125s. KTM has been testing this new bore and stroke on the GP circuit with phenomenal success. Along with the new cylinder that goes with the piston change, KTM put a new lighter crank into the 125SX. QUESTION FOUR: HOW DOES THE NEW ENGINE RUN? Just like the old one. Not what you wanted to hear? Au contraire. We were happy to find that KTM decided not to change the way their 125 runs. While every other 125 manufacturer has wasted time and energy trying to mimic the YZ125 powerband, KTM hasn’t. 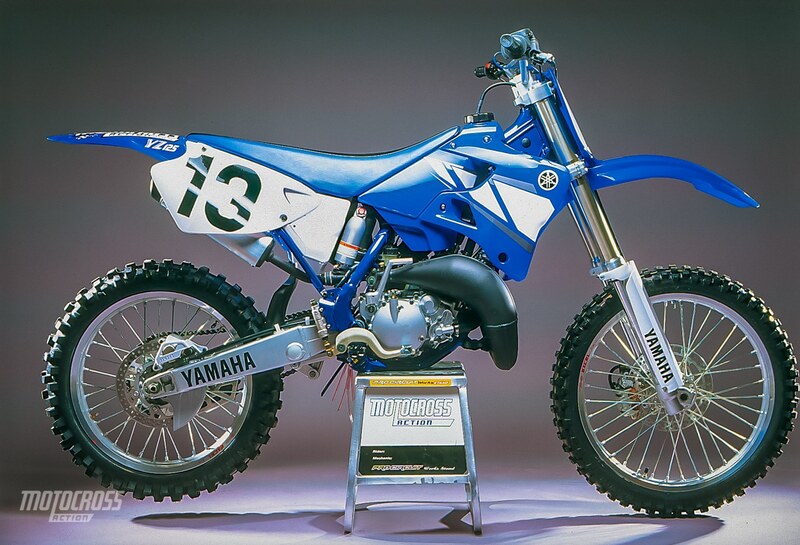 They zeroed in on a mid-and-up powerband and made it work (to the extent that the 2001 YZ125 runs more like a KTM than a 2000 YZ125). We commend KTM for their powerband independence. QUESTION FIVE: WHERE IS THE POWER LOCATED? 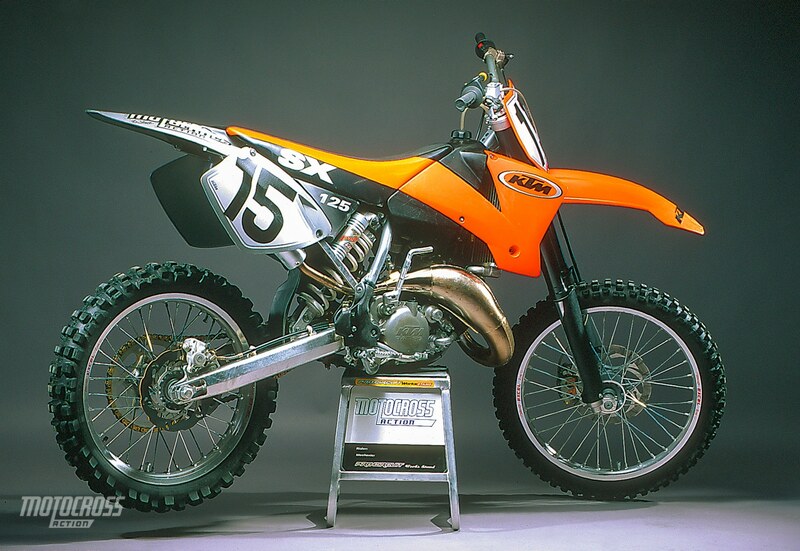 If you consider yourself a lugger, you won’t like the KTM 125SX. It is a mid-and-up engine only. There is no low-end. None. Zero. Zip. Although the KTM is dead down low, it comes to life in the midrange and revs into the upper reaches of the rpm range. Compared to the 2000 KTM 125SX engine, it doesn’t hit as hard, but pulls stronger into the upper reaches of the midrange (while still revving to infinity). QUESTION SIX: WHY DOES THE KTM 125SX REV SO FAR? It has a big carb. Bigger than any two-stroke carb in production (and that includes all 250s–even the KTM 250SX). KTM’s 125SX uses a 39mm Keihin PWK carb. Why do big carbs automatically mean high rpm? When you try to draw fuel through a large opening, like the venturi of a carb, you need considerable suction. At low rpm, the crankcase volume of a 125 does not produce enough pressure to draw fuel through a 39mm carb. However, as the rpm increases, the engine builds pumping pressure and the carb kicks in. At high rpm, a big carb delivers more air and fuel than a small carb. The trade-off is, of course, in giving up low-end for a ripping top-end. QUESTION SEVEN: IS IT THE FASTEST ENGINE MADE? Perhaps. But you can only judge a revver on a long straight. Yamaha borrowed a page out of KTM’s book by mounting a bigger carb on their 125, and just like KTM they lost bottom. This is the price you have to pay if you want the type of power Intermediates and Pros crave. Unfortunately not everyone is an intermediate or a pro. In fact, most racers aren’t. 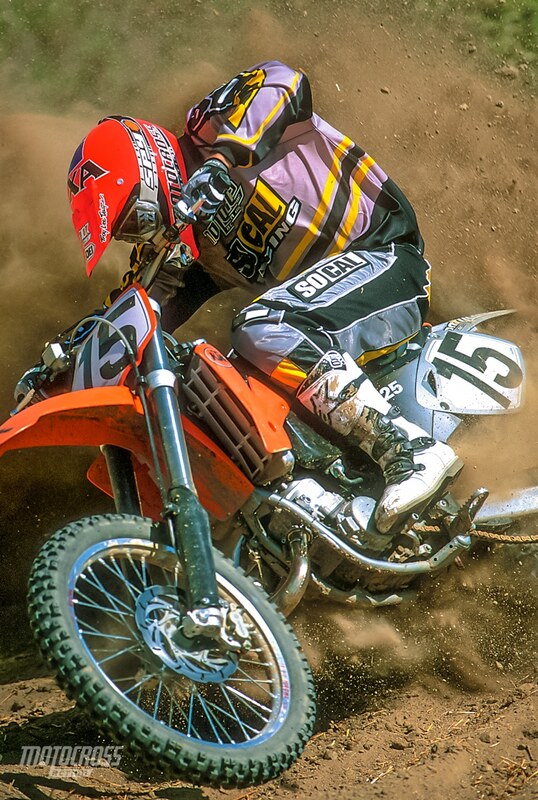 To get the maximum out of the KTM 125SX you have to commit to going wide open. Mid-and-up powerbands like to be hammered at full-tilt. Because of this, the KTM is at a disadvantage where half-throttle settings, low rpm or throttle control are called for. QUESTION EIGHT: IS IT FASTER THAN A YAMAHA YZ125? No, but it’s not slower. In fact it’s about the same as a YZ125. On a long straightaway, the KTM will out pull a YZ125, but in a tight corner-to-corner race the YZ125 will out pull the KTM. Last year, the YZ was much easier to ride than the KTM. Now it’s only a little easier to ride. The YZ is better in situations that require throttle control, like off-cambers, downhills, tight turns and half-throttle circumstances, but the KTM is better when tapped out. Depending on your track (whether it’s a mini Supercross track or a full-blown National course) the Yamaha and KTM trade off tactical advantage. QUESTION NINE: WHAT ABOUT THE JETTING? QUESTION TEN: WHAT ABOUT THE NO-LINK SUSPENSION? In our opinion, KTM has the best rear-suspension system. What we love about KTM’s no-link system is its simplicity, ease of maintenance and logical design. We don’t always agree with how KTM sets it up from the factory, but from an engineering standpoint it’s the best concept. By getting rid of the linkage, bearings, struts, bolts and central shock position, KTM’s engineers produced a highly tunable rear-suspension system that is much lighter than traditional linkage-based rear suspensions. 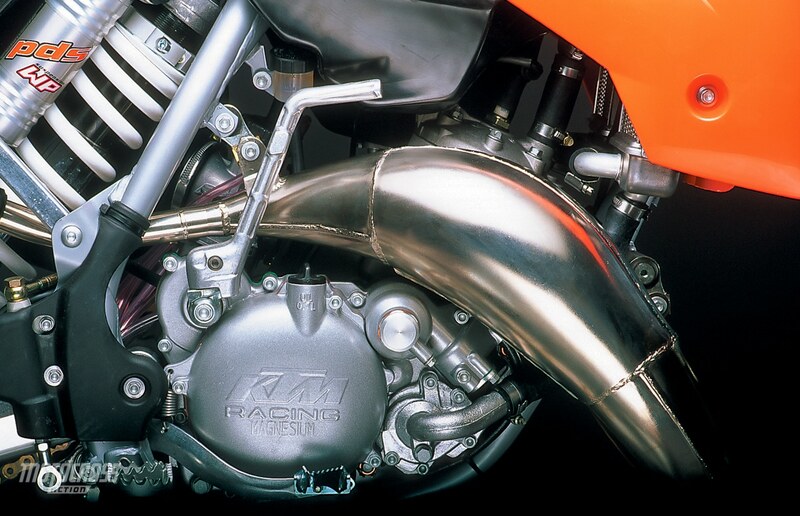 The original design dates back to a Horst Leitner-designed KTM prototype from 1991. KTM didn’t put the design into production until they had the shock to go with the system. The KTM shock features two damping pistons (instead of one). One piston is speed sensitive (to the speed of the oil rushing through it). The second piston is position sensitive (to the location of the shock shaft). How does the WP shock know which piston to listen to? A tapered rod runs down through the shock shaft and halfway through the shock’s stroke the rod activates both pistons (prior to halfway only the speed-sensitive piston is operational). QUESTION 11: HOW WELL DOES THE NO-LINK WORK? As good if not better than most linkage systems. You can take a brand-new 2001 KTM 125SX right off the showroom floor and go to the races. However, getting the perfect setup will require a little reading of the owner’s manual to get you familiarized with all the peculiarities of WP’s adjuster system. The only problems we had with the WP shock weren’t related to how it worked, but to the fact that we’d start the moto with the compression clicker on 4 and by the end of the moto it would be anywhere from 7 to 10. It turns out that the knob sticks out far enough for the rider’s boot to turn it. Trust us, this isn’t KTM’s built-in system to combat shock fade. 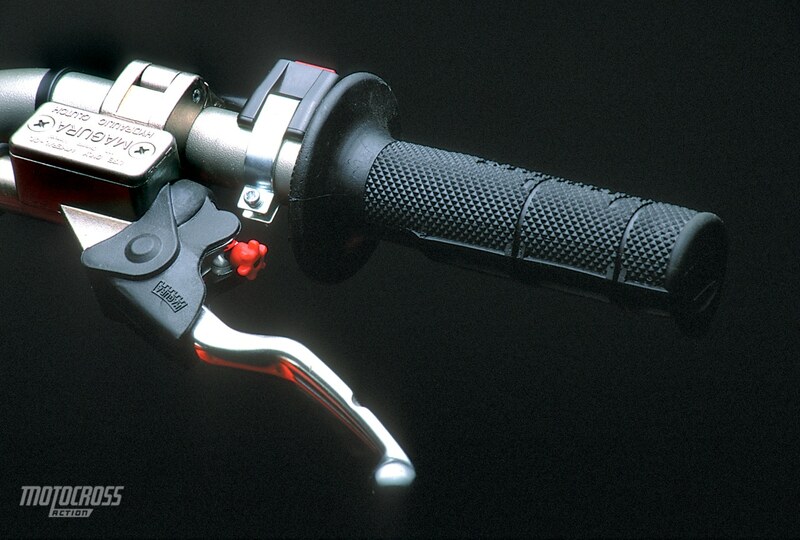 KTM needs to ditch the adjuster knob for a standard flat-blade screwdriver adjuster. QUESTION 12: WHAT WAS OUR BEST SHOCK SETTING? Notes: Common sense and years of experience tell a rider that turning the compression clicker in (clockwise) will stiffen the compression damping. Not so on a KTM. You turn the clicker out for more compression and in for less. WP’s rebound gets slower when turned in. QUESTION 13: WHAT DO WE THINK OF THE ’01 WP FORKS? When WP threw in the towel on its right-side-up forks after the ’99 season, tears ran down our cheeks. They were the last of the conventional forks and they were the best forks we’d tried in a long time. 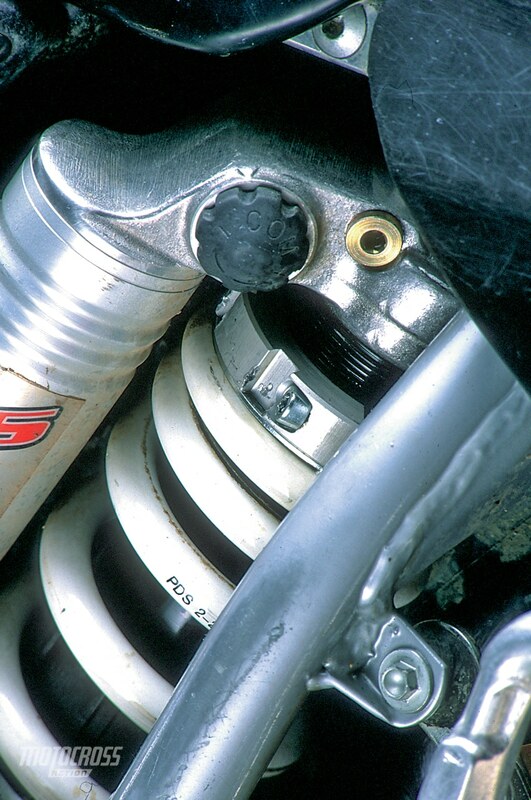 For 2001, KTM kept the same 43mm WP upside-down forks they debuted in ’00. How are the forks? About the same as in ’00 and not nearly as supple or responsive as the ’99 conventional forks. It’s not that the WP upside-down forks are terrible, they are just way undersprung. When was the last time you saw a set of forks come with .38 kg/mm fork springs (most 125s use 0.40 or 0.41 springs). On the track the forks have a tendency to blow through the low-speed compression valving too quickly. Then, they come to rest on the high-speed valving, which is more than capable of stopping them from bottoming, but doesn’t feel very supple on braking bumps. The quickest solution is to ditch the standard .38kg/mm springs for stiffer .41 kg/mm springs. Too bad WP doesn’t make a .41kg/mm fork spring. To get .41 kg/mm springs we had to put a .40kg/mm spring in one leg and a .42 kg/mm spring in the other. We know this is expensive, so try and find a dealer or another rider who needs the same fix to split the cost with you. QUESTION 14: WHAT WAS OUR BEST FORK SETTING? Notes: Unlike KTM’s shock, which has bizarre clickers, the WP upside forks use the exact same clickers as Kayaba. The rebound adjuster is on top and the compression is on the bottom. QUESTION 15: HOW DOES IT HANDLE? If there is one thing that everyone wants to hold against KTM it is their handling. In years past, KTMs have always had a unique, albeit awkward, European feel. Don’t lump KTM’s big bikes in with the 125SX, though. The 125SX doesn’t suffer from the same faux pas as the bigger Austrian bikes. For all intents and purposes, the 2001 KTM handles just like a Japanese tiddler. It likes inside lines, takes ruts just fine and enjoys high-speed straights. QUESTION 16: WHAT DID WE HATE? (1) Color: We like the orange, but we can’t get into the silver side panels and rear fender. Additionally, KTM’s front fender is an eyesore. So is the front number plate, but KTM claims they designed it that way to allow more air into the radiators. (2) Gas cap: The gas cap is too small. (3) Side panels: No matter how you apply the numbers, the angle is always wrong. (4) Rear brake: Last year the rear brake got better, this year it got worse. Within two laps we heard squeaking. Switching to a standard-sized Braking rotor helps. QUESTION 17: WHAT DID WE LIKE? (1) Airbox: It’s cool not to have to remove the seat to get to the filter, but we kept losing the airbox cover’s dzus-style fasteners. (2) Handlebars: The bars are oversized aluminum. Very cool. Additionally, KTM’s triple clamps allow for four handlebar bar positions. That’s two more than any other stock triple clamp and more than most aftermarket ones. (3) Fork guards: Hey, they’re the same as Honda’s. At least they’re black this year instead of silver. (4) Tires: Bridgestone M77/78s are good intermediate-terrain tires. We like this sneaker combo (although we like the rear more than the front). (5) Front brake: They’re still getting better. 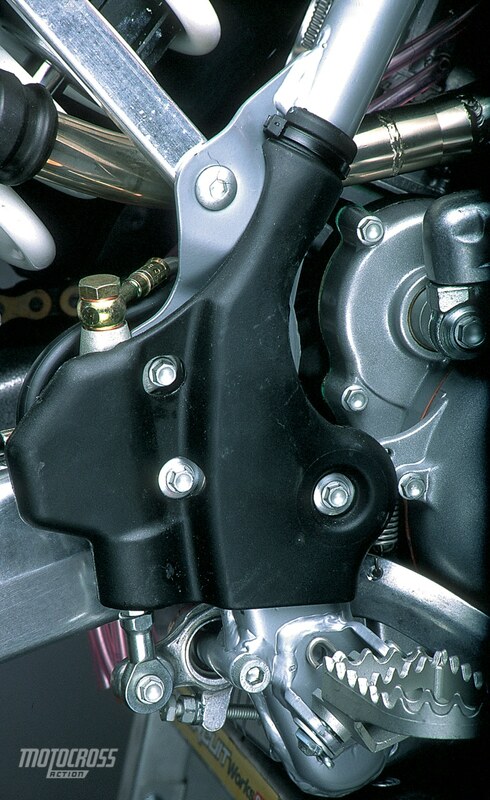 KTM kept the same master cylinder, but they switched to a new leverage ratio and a new lever. We like both better than last year’s. (6) Gas tank: It’s slim. Very slim. (7) Clutch: It’s hydraulic. Enough said. QUESTION 18: WHAT DO WE REALLY THINK? 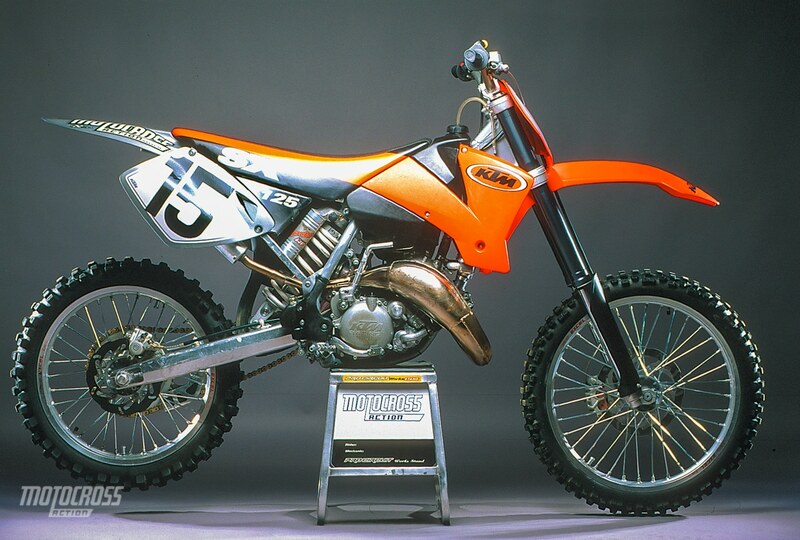 The 2001 KTM 125SX has plenty of horsepower (the most in the 125 class). It handles with aplomb (just like a Japanese tiddler). The price is in the ballpark (about the same as a comparable Japanese bike). The suspension is workable (and cleanly engineered). Plus, it has over-size bars, a hydraulic clutch, cauliflower brake rotors, a chrome pipe and the slimmest lines of any bike made. 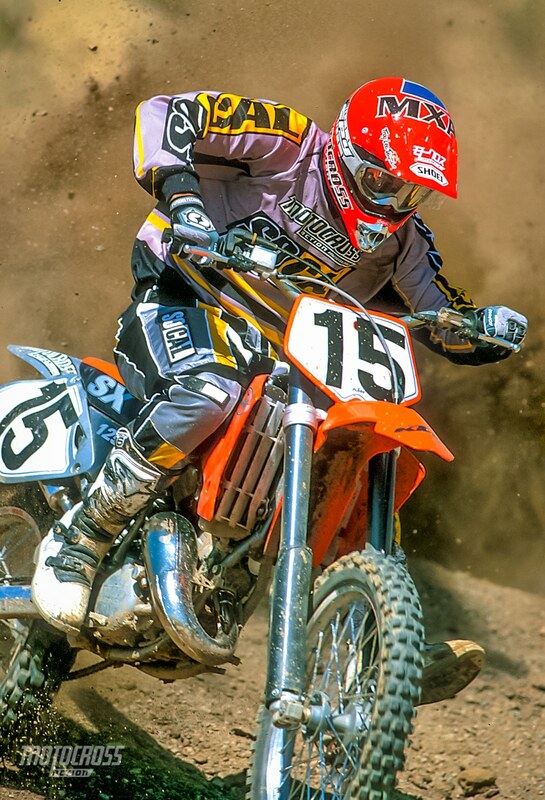 If you’re in the market for a high-rpm 125, start your search at your local KTM dealership.